This is a highly acclaimed oil that is loved by so many. I've been using this for a good six months and I can safely say it's one of my favourites. It promises to help hydrate, add radiance and help skin look younger all in one night. The ingredients are also 99.8% natural. Which normally I'm not too worried about but it's good to know your putting something good onto your skin. But the results this gives are really something to write home about. In the morning my skin looks dramatically better, it really does help give skin a glow. And this takes skin to another level! My skin is so silky and so hydrated in the morning. I also think this is helping to reduce the marks blemishes leave behind. It has a pipette dropper applicator, which makes it easy to dispense the correct amount. I find 3 drops is enough to cover my whole face. I use this as a last step to lock in all the other products I have used. This is a great all rounder. I feel like the name 'super food' is very fitting for this oil, because it is really like super food for skin. It's jammed packed with vitamins, nutrients, and anti oxidants that all work to help nourish the skin and protect it from environmental damage. Like Kielhs this is mostly natural ingredients and it has the same pipette dropper. I also use this at night and as the final step to my skincare routine and the results are incredible. This absorbs a lot quicker than the Kielhs one, so it's great if you don't like the feeling of oils on your skin. It instantly leaves my skin softer and smoother. I really feel like this is having a long term effect on my skin; When I use this regularly my skin doesn't feel as dehydrated. I can't recommend this enough. I went to a Simply Argan event during the week which was so much fun (I'll be posting more about that soon), but a few weeks before this dropped through my letter box and I was super excited. I've not really come across Argan oil skincare, It seems to be big hit within hair care. But it's supposed to have great healing and nourishing properties. This night oil, again contains all natural ingredients. 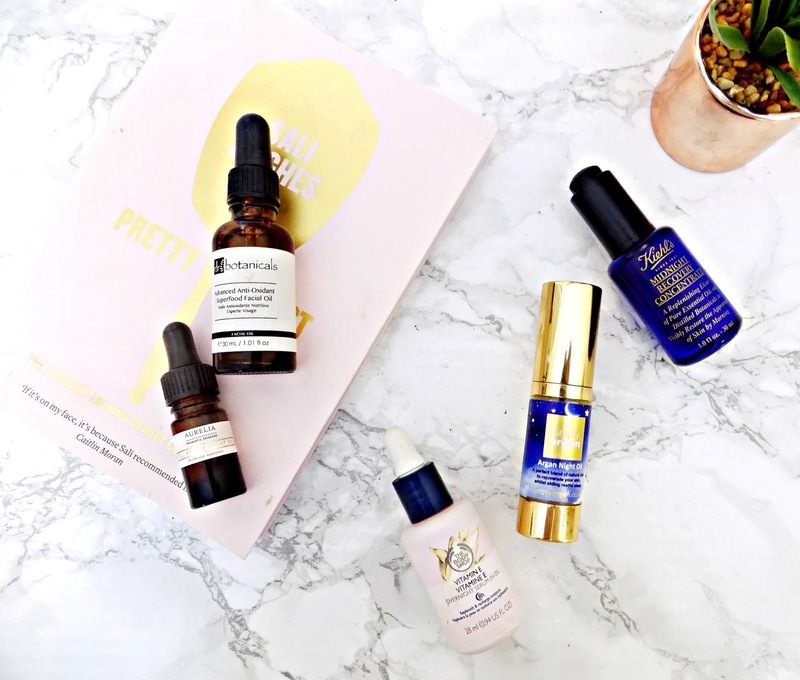 With Argan oil being the top of the list, which is pretty impressive! The oil is a lot thicker than others which makes it easier to apply, without it running all down your hands. It also has a pump as opposed to pipette, which I'm still on the fence about, This doesn't absorb instantly but does completely absorb by the morning. The result - I'm left with super soft smooth skin, that feels and looks hydrated and plump. This is also really soothing on angry breaks outs! I'm really loving this oil and I'm excited to try more from the brand. Key Ingredients: Argan Oil, Herb Oil, Citrus Sinensis Peel Oil, Santalum Austrocaledonicum Wood oil. This bodyshop offering is a serum and an oil in one. Which is great, anything that saves time in my lengthy skincare routine is a winner. This has a pipette applicator that functions well. The oil itself contains vitamin e which is known for it's hydrating properties as well as other great ingredients. The oil itself is quite light weight, not as light weight as the Kielhs or the Dr Botanics one but not heavy. Because this is a serum it's recommended to use it before moisturiser. But I don't like it this way, I find it's too oily and doesn't absorb quick enough, so I use it last. But the results are really good. It definitely leaves my skin soft and hydrated. I do really like this oil and it's a great affordable option. But I don't love it as much as some of the others. Aurelia is another all natural brand that uses probiotic technology to be bring us effective skincare. I only had a small bottle that I've polished of but I will definitely be re-buying the full size one because this stuff is amazing! Like the other oils it has a functional pipette applicator. The oil is slightly thicker than the others but not as thick as the Simply Argan option. But it's still fast absorbing. I use this lastly in my night time skincare routine. This really hydrates my skin, since using this my dehydration lines have significantly reduced. My skin feels firmer, softer and so smooth. It also helped my skin to glow and just look more awake and alive. This stuff is pricy but I think it's worth it! Key Ingredients: Sweet Almond oil, Hemp oil, Wheat Germ oil, Olive oil. Can you tell I love facial oils? I have so many more that I'm currently testing that I will be posting about soon!